How to report a cybercrime. PHOTO: Cybercrime Magazine. 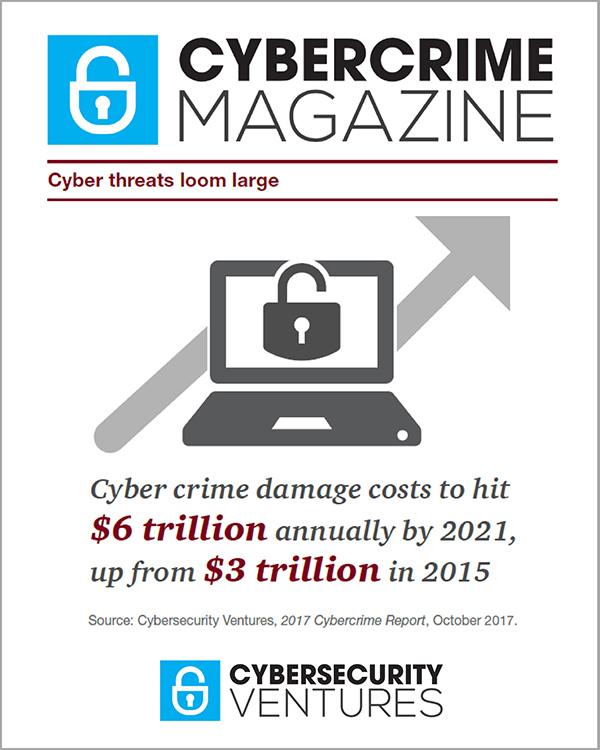 The Secretary of the U.S. Department of Homeland Security shared research from Cybersecurity Ventures in a keynote address at the recent RSA Conference 2018, stating that cybercrime damage is estimated to hit $6 trillion annually by 2021. Cybercrimes should be reported to appropriate law enforcement investigative authorities at the local, state, federal, or international levels, depending on the scope of the crime, according to the U.S. Department of Justice. The FBI is the lead federal agency for investigating cyber attacks by criminals, overseas adversaries, and terrorists. The FBI’s Internet Crime Complaint Center (IC3) accepts online Internet crime complaints from either the actual victim or from a third party to the complainant. “With cybercrime growing at an alarmingly fast pace, it is more important than ever to contact law enforcement when you are a victim of a cybercrime,” says Scott Smith, Assistant Director, Cyber Division, Federal Bureau of Investigation (FBI). The Deputy Attorney General of the DOJ quoted research from Cybersecurity Ventures in his speech at the recent Cambridge Cybersecurity Summit, saying global cybercrime costs are predicted to double from 2015 to 2021. In response to the growing cyber threat, we researched and compiled this directory of U.S. federal law enforcement contacts. The editors at Cybercrime Magazine will be updating this directory later in 2018. –Di Freeze is Managing Editor at Cybersecurity Ventures.